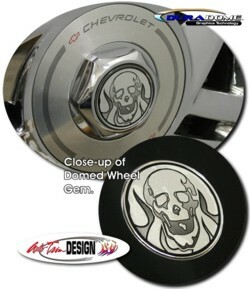 Enhance your '93-'97 Chevrolet Camaro's factory wheels with these radical looking chrome Skull and Fire "domed" gems. Skull and Fire image is Black with a slight fade on Chrome Foil as shown. Packaged in a set of four (4) and fit perfectly on the wheel style as shown in the picture. It's very easy to install (Just install on top of existing wheel centers!) and includes easy-to-follow online instructions. Get yours today!